I tend to do well with goals and deadlines and when I begin to contemplate a new project I’ve always found it important to start with where I am and figure out where I want to go. Quite often the journey leads me onto unexpected destinations by paths I could not foresee. The journey is the path and therein lies the fun and adventure. My interest in collage grew out of several abortive attempts at cutting silhouettes and that led to to doing some portraits with cut paper mosaic and I like the idea of returning to this way of working. It can get a bit tedious and very time consuming but if you work small and fast you can produce some very interesting pieces. Some of these are seven or eight years old and I haven’t taken a good look at them in a long time but it is part of the evolution of style. Next to the Azaleas at the Masters, nothing is more symbolic of Spring here in Northeast Georgia than the Dogwood (Cornus florida). They have begun to bloom. Over the years I’ve done several paintings, drawings and sketches of Dogwoods so as the Spring progresses not too slowly evolves into Summer here in North Georgia I wanted to share these with you. I’m going to change my medium of choice and begin working in Collage again for awhile. My subject will still be nature native I just want to play some with the presentation a bit. I am beginning to enjoy how the charcoal goes into suspension and granulates when the Gum Arabic mix is brushed over. Another thing I find fascinating about using Gum Arabic in this strong a mix is how much it facilitates lifting, especially when you are using non staining colors. Gesture 006 is the first from this series that I used pastel white instead of white gouache. I also did more extensive lifting with this piece and will certainly experiment with that even more in the next few works. I’m excited by the ease of lifting because I’ve never liked the results I have gotten in the past when trying to lift color. The surface has tended to get too distressed up or I’ve chosen the wrong colors colors to try and lift. The downside of this easy lifting is you have to be very careful in layering your glazes or you’ll lift when you don’t want to. One pass and you can not go back into or lift the color underneath. With this in mind I’ve begun to use 1″ and 1/2″ brushes. You also have to make sure each layer is completely dry between glazes if you want your color to stay pure and bright. I’ve been enjoying working up these gestures and pushing the charcoal/watercolor mix. You can only learn what a technique or media is capable of doing by pushing it until it stops working. It’s about the learning and polishing the process. I’m developing a special set up for working with charcoal and watercolor. Because the charcoal does go into suspension as you paint I decided to use my small ten well plastic palette (if I want to continue with charcoal and watercolor I may invest in a small porcelain palette) so I don’t contaminate the paints in my larger palette. Since I’m in my experimental phase I’m also not using my better brushes. I’m also trying to find the right water/Gum Arabic mixture. This painting began as a quick sketch using my homemade charcoal then I used some soft compressed charcoal to add a bit more depth to the darks. Once I was satisfied with the drawing I began to use the Gum Arabic mix to bind and spread the charcoal about. There are some interesting things happening with the charcoal during this part of the process. Once the binder dried I added washes of ultramarine blue, dioxazine purple and burnt sienna; as well as, white gouache for some highlights diluted with the same mix of Gum Arabic/water mix I used as the charcoal binder. This particular mix does add a nice gloss and brilliance to the color. 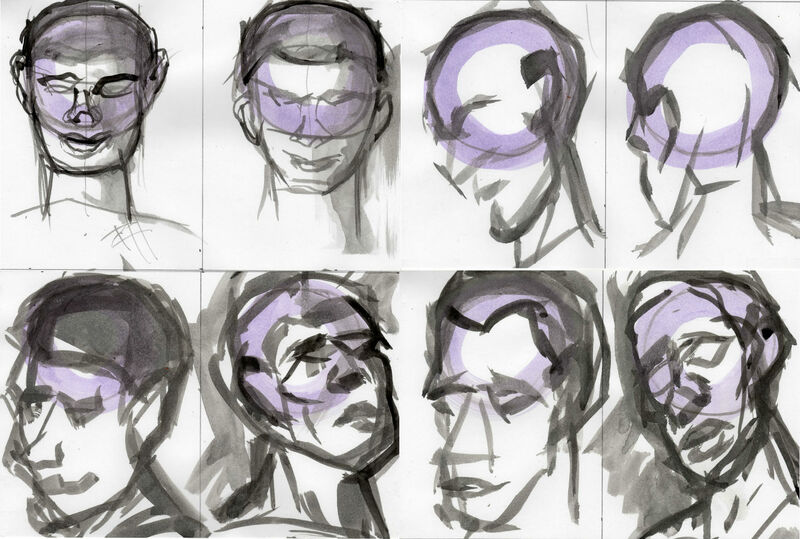 Drawing heads 9 developed into a full blown painting right before my eyes which is where all my paintings develope and I had a great deal of fun working it up. I feel the need for some figure drawing so it’s time once again to give a shout out to the folks at Croquis Cafe. None of the drawing of heads I’ve posted lately have been done from this wonderful resource but the work I’ll be posting the rest of this week will. If you have not visited these folks do so very soon. 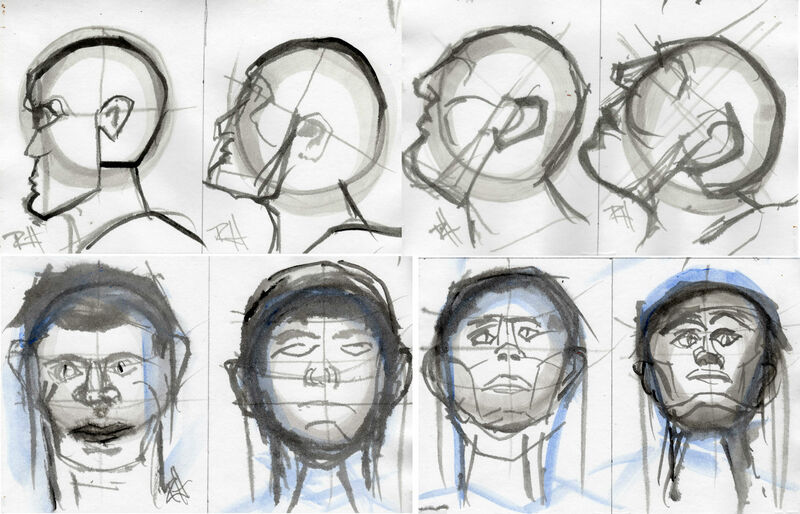 Drawing heads 8 is about seeing the planes of the head. There is a fine line of balance between the carved look of planes and the rounded and curved surface we normally perceive looking at the people we meet. When we look we quite often don’t see. It is a great deal of fun for me to be on this journey of discovery. I’m learning new ideas and ways to see the head as well as it’s structure; as well as, draw with the brush. Another important lesson I’ve learned is in order for me to draw well with the brush I need to draw larger. With Drawing heads 5 I am continuing to enjoy drawing with the brush. I find it much more expressive than any other way of working. It is not the first explorations in brush drawing but now my commitment is much stronger. 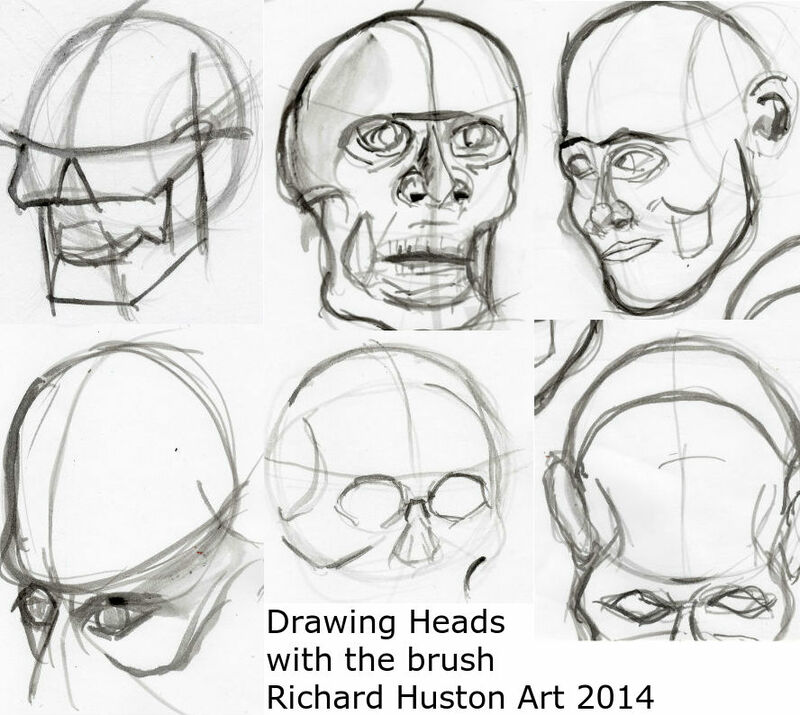 Drawing Heads 2 is the second post about my new project, learning to draw heads. 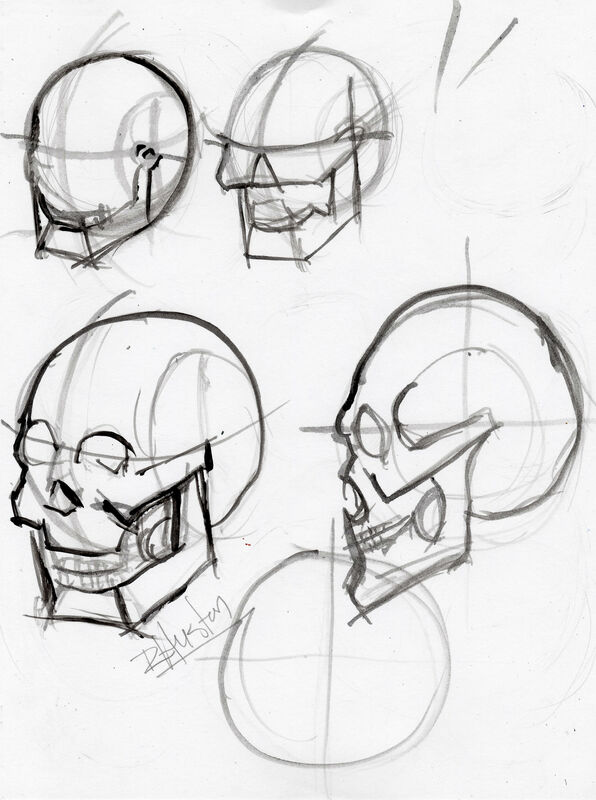 So far I’ve done 3 pages of exercises and I’m learning a great deal about how the features fit on the skull. 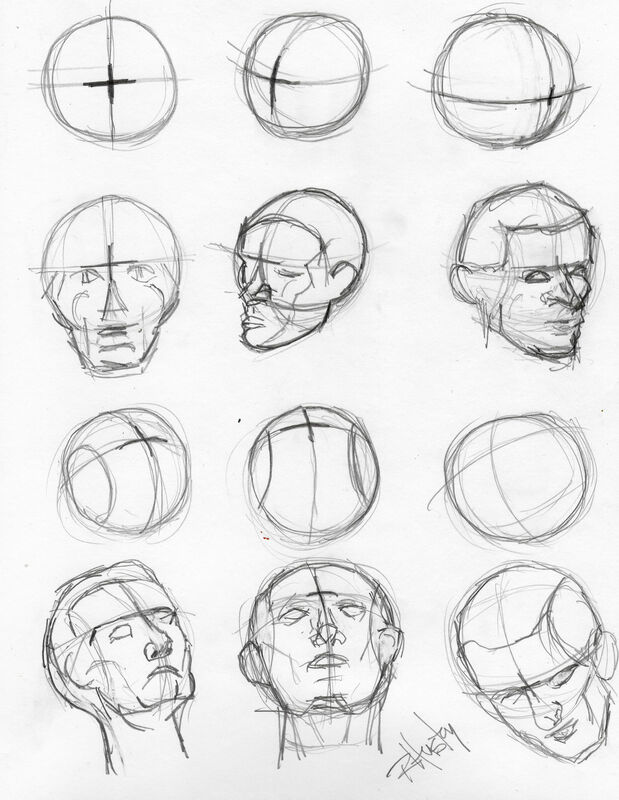 I have had a copy of Andrew Loomis’ Drawing the Head and Hands for a long time and up until now I’ve only used it a reference on occasion or taken a cursory glance at what he had to say. This time I want to work my way through the book and take the journey. One of the things I like most about Drawing the Head and Hands is how positive and encouraging his writing is. These exercises are designed to help you visualize the skull as a ball or sphere and see how the features are arranged on it at different angles. One of the things I’ve often had difficulty doing is getting the angle of the head right and this series of exercises have certainly helped me see how that can be accomplished. I am embarking on my new project, drawing heads. I announced that my new project was going to be hands but when I look back over my work and seriously consider my strengths and weaknesses there is one glaring shortcoming. Actually there are several but drawing heads and making them feel right is one of the biggest. I heard the great basketball player Dominique Wilkins explain during the broadcast of an Atlanta Hawks game how he had achieved excellence. During the off season Dominique would examine his game and pick the weakest part and work on it until it became a strength. This is the kind of commitment required to excel at anything. To start this new project I wanted to have a strong foundation. So I began to look at some of the books I have around and picked one I’ve had for a long time, Andrew Loomis’s Drawing Heads and Hands. The quote below is from the book. Of course, reading and a genuine motivation won’t feed the bulldog. You have to do the work.